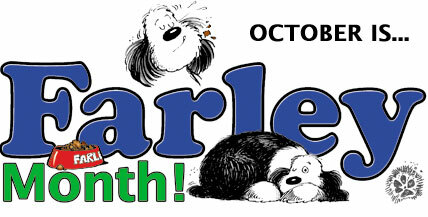 Home » Events » October is Farley Month! October 1st marks the first day of Farley month! We at the Omemee Veterinary Hospital understand how devistating it is when a pet becomes sick or injured. It is an even harder situation when a pet owner is unable to provide necessary veterinary care due to financial contraints beyond their control. That’s where the Farley Foundation comes in! Since 2002, the Farley Foundation has assisted well over 6,200 low-income pet owners (seniors and individuals receiving ODSP) by subsidizing the non-elective veterinary care of their sick or injured pets. Every October, clinics around Ontario do an extra little bit of fundraising to help with this great Foundation! For the month of October, the Omemee Veterinary Hospital will be offering nail trims for a minimum donation of $10! Call us to book a nail trim today! You can also stop in and donate any time, or visit the Farley Foundation website and donate online! Each donation at the clinic will have a paw print put up in the clinic in your name to thank you for your generosity. If you would like to know more information about the Farley Foundation please visit http://www.farleyfoundation.org/. Donations are accepted all year round!